A mass grave has been uncovered in Eastern Ukraine. 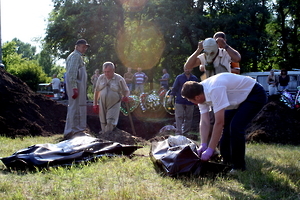 According to a first-hand account from Yulia Gorbunova at Human Rights Watch, Ukrainian authorities were exhuming a mass grave in Sloviansk late last week, a city which had been under the control of anti-Ukrainian government insurgents from April until July 5. It is too soon to say whether the bodies – 15 is a conservative estimate – were buried there as part of a crime. The bodies could have been brought from the local morgue as there had been no electricity in parts of the city at the time of the dumping, making refrigeration impossible. But when local women asked the insurgents who was being buried at the site, they said the bodies were unidentified. When Gorbunova visited the site, one woman was there looking for the body of her husband who had called her in May to say a final goodbye after insurgents told him they would be executing him 15 minutes later. She had identified his body in a morgue but the insurgents had refused to hand over his body. Another man was looking for the body of a friend who had gone missing after being picked off the street by insurgents after getting into a fight. A full investigation must be undertaken to determine whose bodies were buried in the mass grave, and how they came to be there. Furthermore, the abuses carried out by the insurgents while Sloviansk was under their control, must be investigated as well.